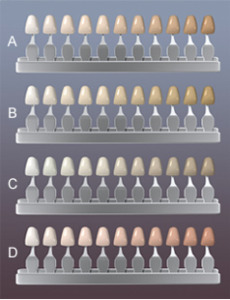 Precise color matching is a vital component of successful aesthetic dental restorations. Producing porcelain crowns and veneers with the exact features of a patient’s natural teeth goes far beyond matching a single color. Restorations that don’t match exactly will stand out, and although a bright white smile is usually the goal, a shade too light can be just as problematic. Because teeth naturally darken over time, this must also be evaluated and taken into consideration when creating a long-lasting restoration. 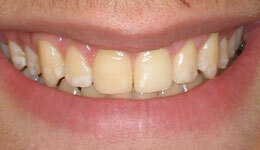 The goal is to produce a natural-looking restoration that will blend with the natural darkening surrounding teeth. 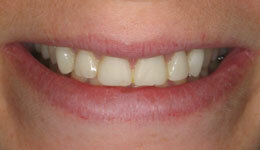 For these and other reasons, color-matching has historically been a common obstacle in creating aesthetic restorations. 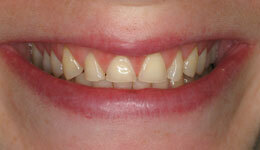 It is no longer enough to use traditional shade guides to match tooth color. These shade guides provide the hue and chroma of the tooth, but do not consider other dimensions of the adjacent natural teeth. A photo of the patient smiling. A photo with the lips and cheeks retracted. A photo with the selected shade against the adjacent teeth. When evaluating the shade, our specialists will examine the adjacent teeth at different angles to accommodate for curved translucent surfaces, and the layering and properties of the tooth’s enamel. Photographs are a beneficial tool for color matching, however, the shade should be selected under specific lighting. A standardized full-spectrum light source is used while selecting the shade to ensure an accurate match. However, modern technology has allowed us to precisely match your natural teeth – not only just their color, but also their brilliance. With renowned porcelain brands like Empress and DaVinci that create luminescent crowns and veneers and our computer-generated precise color matching system that takes your natural features into consideration, we are able to offer the most accurate color matching available – all in the comfort and convenience of our midtown dentist office. 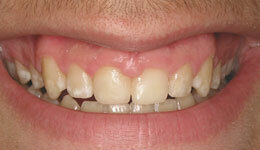 For all of your restorative dentistry needs, schedule your complimentary consultation by calling (212) 581-1091.